The Bold and the Beautiful (B&B) spoilers for the next two weeks tease that big trouble is brewing. The week of October 30-November 3 will bring great power for Bill (Don Diamont). He’ll show off his control and Liam (Scott Clifton) will feel completely duped. The Spencer men will face more conflict as Sally’s (Courtney Hope) dreams are threatened once again. Meanwhile, Sally and the Spectra gang will get ready for Halloween. Saul (Alex Wyse) and Darlita (Danube Hermosillo) will pick a costume that gives Sally a shock, but it’ll be nothing compared to Liam’s upcoming news. He’ll let her know that Bill intends to destroy Spectra, but Sally’s feisty side will come out. She’ll come up with a risky plan and they’ll do their best to stop Bill’s nasty move. The Bold and the Beautiful spoilers state that Bill will be livid when Liam and Sally dare to stand in his way. Steffy (Jacqueline MacInnes Wood) will be equally appalled by Bill’s behavior. She’ll be quite disappointed in her father-in-law after all the work they did. Steffy really thought Bill was going to turn from his wicked ways, but she was obviously wrong. However, some confusion could change everything. After Bill blows up the Spectra building, he’ll realize that Sally and Liam were presumably inside. Bill will experience total devastation as he copes with what he’s done. He’ll be forced to confront who he is as a person and it won’t be pretty. 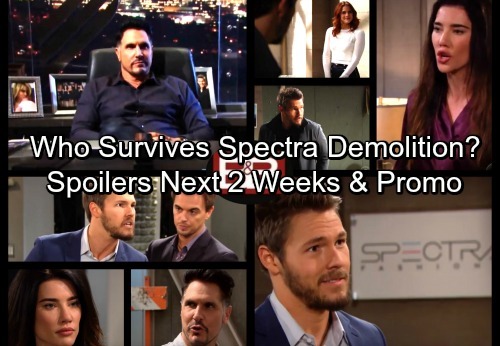 The week of November 6-10 will deliver growing fears for Bill, Steffy and Wyatt (Darin Brooks). Once they get updates, Wyatt and Steffy will undoubtedly give Bill an earful. They’ll have to consider the possibility that Liam may be dead. B&B spoilers say they’ll all reel as they cling to the last glimmer of hope. Elsewhere, the Spectra crew will see the aftermath of Bill’s actions. Shirley (Patrika Darbo), Darlita and Saul will be crushed once Spectra is officially gone. They’ll inevitably panic if the hear Sally was still in there at the time of the blast. It sounds like chaos will be the main theme that week. There’s a good chance Liam and Sally will survive, but this could give them the opportunity to turn the tables. There are many ways they can make Bill’s blunder work to their advantage. The guilt alone could be enough to scare Bill down a new path. Are you excited to see Bill squirm a little? We’ll keep you posted as other Bold and the Beautiful details emerge. Stick with B&B and don’t forget to check CDL often for the latest Bold and the Beautiful spoilers, updates and news.